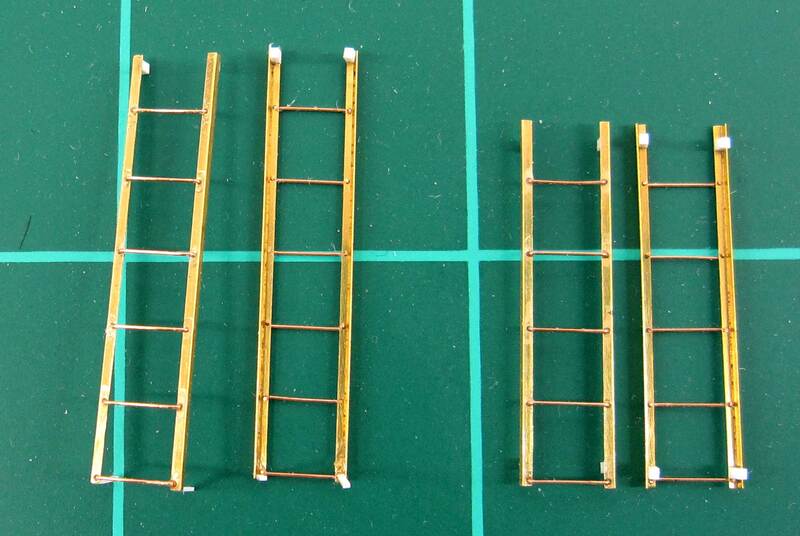 Nelson Moyer sent along assembly tips for etched metal ladders that offer another step in freight car detailing. Here’s Nelson with more. 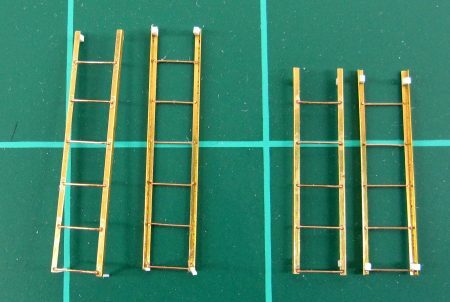 Yarmouth Model Works has introduced a line of etched freight car detailing products that includes freight car ladders and ladder rungs. Stiles are etched to accept 0.012-inch brass wire rungs, or you may choose to use the etched rungs available separately. If Tichy 0.0125-inch grab irons are used, the holes must be drilled out with a #80 bit before removing the stiles from the fret. The stiles are phosphor bronze, which is harder than brass, and while it is more durable, it is harder to bend. Scribing the fold line with a #11 blade makes the stile easier to bend. There are two ways to bend ladder stiles. One method is to place the side of the stile with rung holes into the bender with the solid edge hanging over the edge of the bending tool, then pushing the extended edge down against the vertical side of the bending tool with the knife edged bar that came with the tool. The second way is the one described herein. 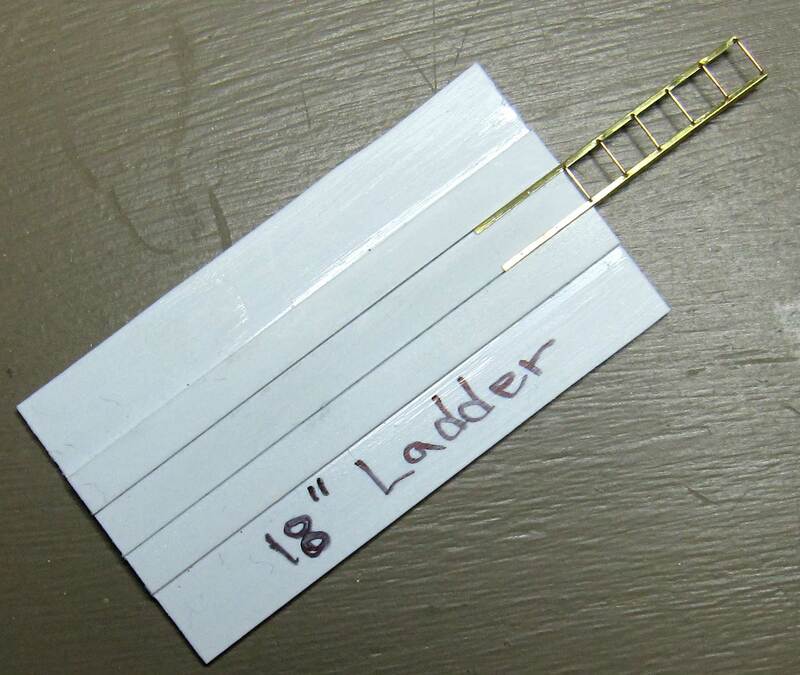 Make a jig from 0.030-inch thick styrene or 1/32-inch thick plywood measuring the width of the desired ladder. Mount the jig on a base of 0.060-inch styrene or 1/16-inch plywood. It is helpful to make the jig length long enough to provide a ‘handle’ while handling the stiles during construction. Use styrene if using CA to glue rungs, and use plywood if the rungs are to be soldered. A Ladder Assembly Jig can be made from scrap materials. Nelson’s jig was made from styrene and is ready to build 18-inch wide ladders. Frets may be fingerprinted or tarnished from handling. Clean fingerprints using 91% Isopropyl alcohol. Remove tarnish by sanding lightly with 1000 grit sandpaper. Wipe fret to remove residue. 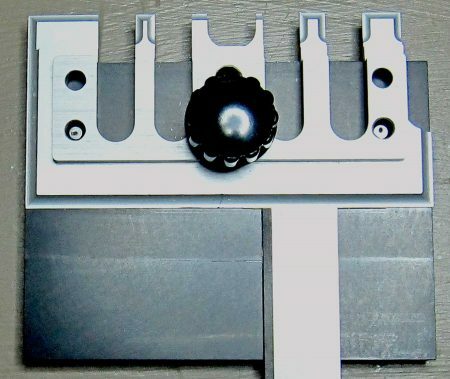 Drill out the laser cut holes using a #80 bit in a pin vise. Trim the stiles from the frets using photo-etch scissors. The stiles are attached to the fret in mirror image pairs for the right and left sides of the ladder. 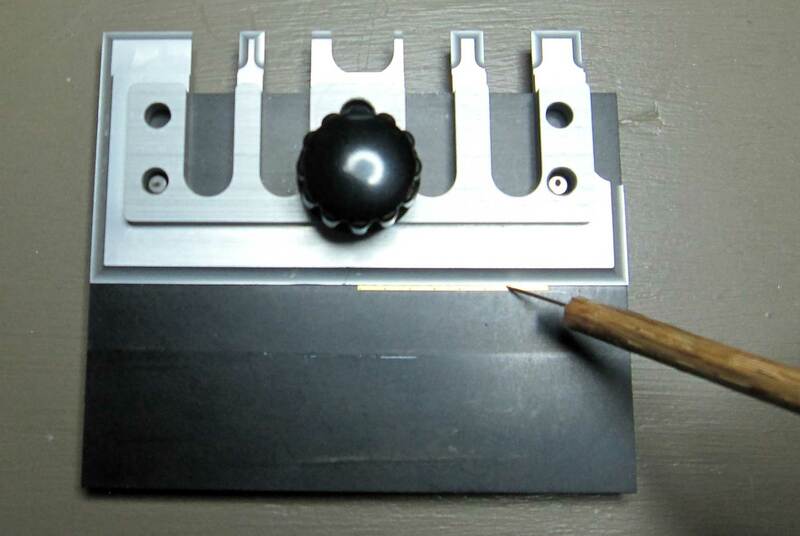 Bend the stiles to a right angle along the score line using a bending tool, as seen in the image above. Clamp the stile so that the ladder side is under the foot of the bending tool and the score line is entirely visible. Use a needle to make fine adjustments by placing the point on the rung holes and sliding the stile gently into position while applying light pressure to the foot of the bending tool. Run the needle point along the score line to insure the score line is parallel with the foot of the bending tool. 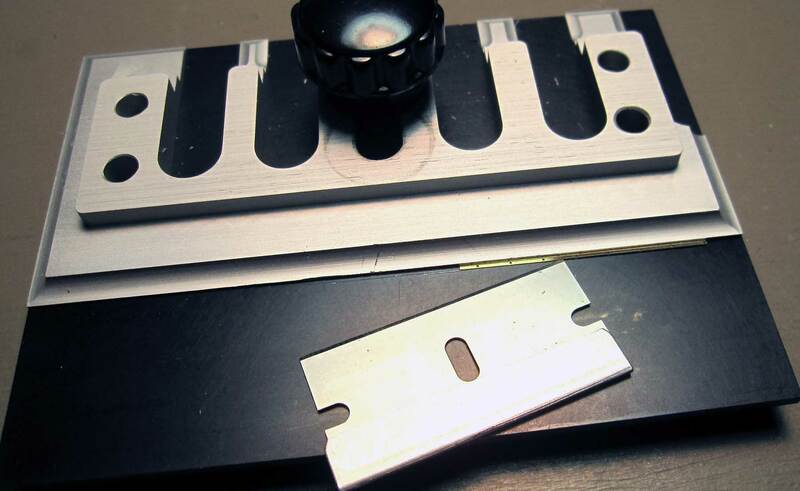 Run the corner of a single edge razor blade at a low angle along the front edge of the stile so that the outer edge is raised slightly. Carefully align the long blade under the stile, the press forward and gently but firmly rotate the blade to make a right angle with the base, forcing the stile against the foot of the bending tool. Use the flat end of the long blade to firmly press the stile against the foot of the bending tool. Release the stile from the tool and inspect. Place two stiles in the jig with the holes to the inside, and the bottom set of holes extending slightly past the end of the jig. Check hole clearance with a #80 bit in a pin vise. Trim the legs of an 18-inch grab iron very short then insert it into the holes. Slide the stiles out so that the next pair of holes is slightly past the end of the jig. Repeat the above steps. Continue adding rungs until six rungs are in place, with the sixth rung snug against the jig so that the ladder is square. Insure that the rungs are snugly against the stile then use a pin to place a small drop of thin CA on each end of the first five rungs. Blot excess CA with a scrap of paper towel. Allow the CA to set for at least one hour. Gently slide the ladder forward and install the last two rungs using the first few steps. Slide the ladder forward in the jig until the last rung is clear then place a small drop of CA on each end of the remaining two rungs. Blot excess CA with a scrap of paper towel. The jig stabilizes the ladder while gluing the last two rungs and the previously glued rungs will hold the ladder square. Place the finished ladder on a small piece of wax paper, and allow the CA to set for at least one hour. Cut 0.040-inch long blocks to use as mounting tabs from 0.020 x 0.030 styrene strip. Refer to prototype photographs for placement of tabs along the stiles. If photographs are not available, use the tab spacing from plastic ladders supplied in kits. Glue pairs of tabs to the inside of the ladder stiles at the top, middle, and bottom of the ladder using CA. Inspect finished ladder and determine the ladder location on car. Attach the ladder to the freight car using CA. 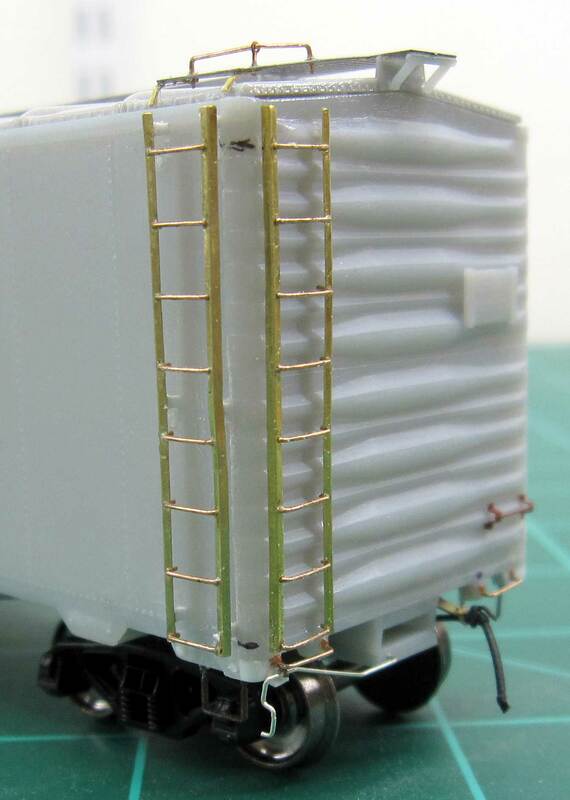 The bottom of the refrigerator car ladders pictured above attaches to the bottom of side sill with a steel strap, hence the long mounting tabs on the side ladders. The excess length is cut off after the ladders are mounted. 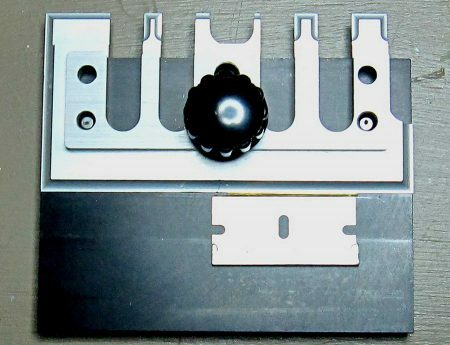 The Small Shop offers a variety of bending tools for etched metal parts. Excess CA and other contaminants can be removed during media blasting. It is highly recommended that finished cars with photoetched hardware be media blasted prior to painting. Do not handle car with bare hands during or after media blasting. 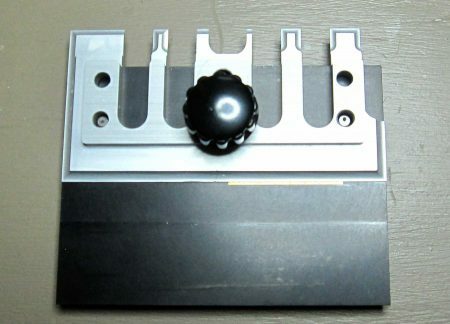 For shortening eight rung ladders with the same rung spacing as seven rung ladders, cut the stiles just below the seventh pair of holes before bending. 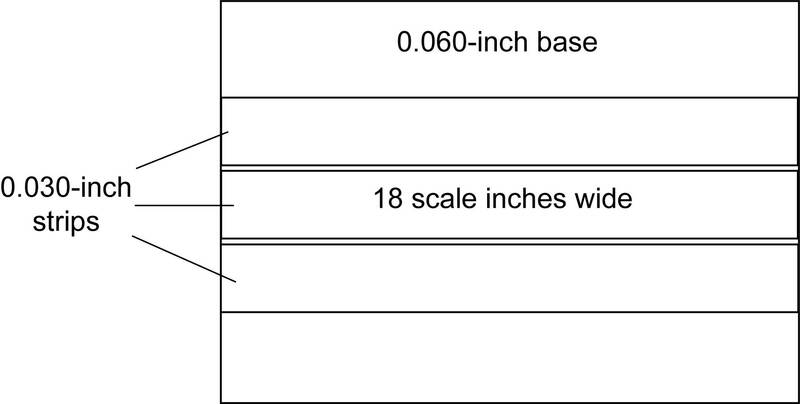 Refer to prototype photographs for ladder length and configuration. 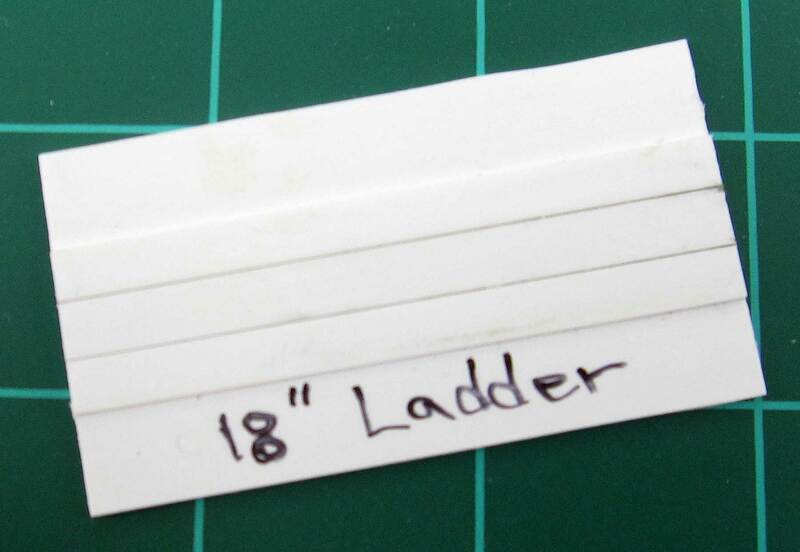 It is difficult to cut custom length mounting tabs for end ladders on cars with corrugated ends because the placement would determine length of each individual mounting block. Glue the end ladders directly to the ends without mounting tabs, or use the elongated etched rungs at the top and bottom of end ladders by drilling holes in the ends, and insert pins into the holes to secure the ladders. Etched metal detail parts are becoming commonplace in many resin craftsman kits. These parts can reflect the delicate natures of details yet are robust for active models. 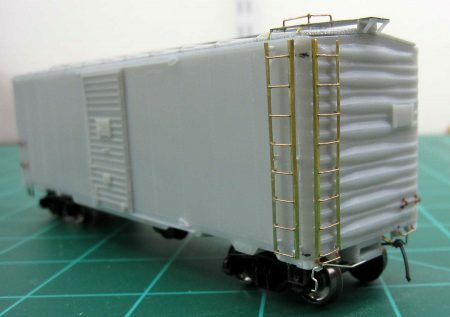 Yarmouth Model Works has a wide variety of etched parts available now and more will be introduced as time goes on. Thank you, Nelson, for an insightful summary of your techniques in building these ladders. Military modelers have been using etched metal parts for years. Etched metal parts provide new opportunities to upgrade our models. Thanks for the write up on my products. But I have to make one major correction. The ladder stiles sold separately as detail parts are etched in brass, while some of the kits are supplied with phosphor bronze ladder stiles. The brass stiles are much easier to bend. And it should be noted that all future Yarmouth Model Works kits will include brass stiles and etched rungs. Excellent discussion. One further suggestion: for bending the stiles, use The Small Shop’s “Bug” bender. Insert stile in the bender as described above, but use an outer edge, so the outside half of the stile is hanging out in space; bend against a smooth steel surface with a rolling motion of the hand-held Bug. It’s much easier to get a smooth bend than by trying to pry the outer edge up with a razor blade or whatever. Excellent presentation, Nelson. I have saved it and will follow your technique on my next resin house car build. Wonderful documentation – makes it look easy enough even I could do it. Question – how do you know how wide to make the ladder? I noticed there were quite a number of etched rung lengths – how do you choose? YMW ladders are designated by rung spacing, i.e. vertical distance between rungs. 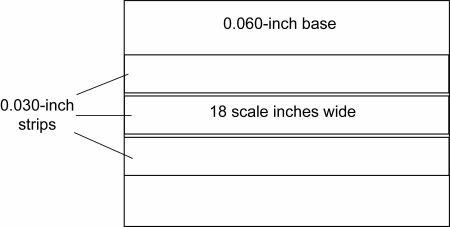 The ladder width is determined by the length of the rungs used, e.g. 18 in. grab irons, or whatever length you choose. Jigs must be made for each width ladder you wish to build.